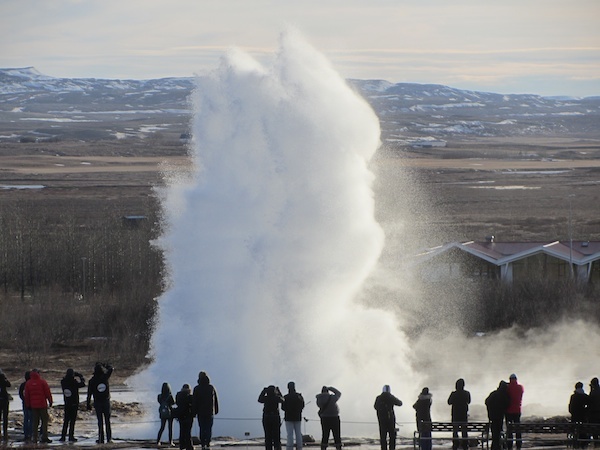 The journey from the north west to the south west of Iceland takes a couple of days and passes through a number of areas containing waterfalls and geothermal activity. We had intended to make an early start, but got chatting to the nice people at the HestaSport activity centre in Varmahlíð and it was after ten when we finally hit the road. 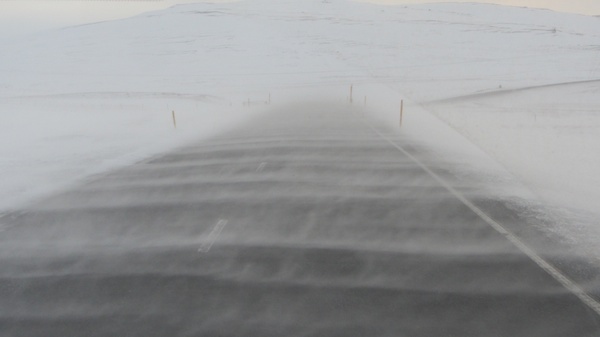 The initial climb over the pass to Blönduós was beautiful in the sunlight, with fresh powdery snow being blown in ever-moving snake-like patterns across the road and down the frozen river alongside. We stopped off at Deildartunguhver, the largest hot spring in Europe and probably the most voluminous hot spring in the world. The flow is now piped off to serve the hot water needs of the neighbouring towns, but there is a long strip of scalded land where boiling water bubbles and spits to the surface. Our next stop was at the twin waterfalls Barnafoss and Hraunfossar. The first (‘child falls’) is a narrow ravine which used to flow through stone arches. The story goes that the mother of two children who died there broke the arches to make it safer. The second (‘lava falls’) is quite interesting. It’s not really a waterfall as such, but a line of spring water pouring out from between two strati of lava rock, resulting in a long line of small falls dropping into the river below. Our room for the night was at an out-of-season golf hotel, the Icelandair Hamar in Borgarnes. It was operating with a skeleton staff, but fortunately one of those was the excellent chef and we once again dined in perfect Icelandic style. This country is a foodie heaven. We kept the curtains open that night, and were once again treated to a spectacular display of northern lights. It was brief – only about five minutes long – but enormous, with green-tinged arms spreading right up into the sky in a shimmering triangle. Dawn (10 am!) saw us already on the road, because we needed to put some miles under our belt if we were to tackle the standard Reykjavik tourist trail, the Golden Circle. Passing through Laugarvatn on the way to Geysir we found ourselves feeling a bit peckish. We by-passed several ‘coffee cup’ traffic signs and then found the ‘knife and fork’ which meant a proper restaurant. At the door of Lindin, we were greeted by the owner and head chef, who seated us and presented us with a simple menu of extravagant dishes. We had scored again. As a starter I had four different carpaccios of game; goose, reindeer, horse and whale, accompanied by a rather excellent goose liver pate. Bronwyn had been hankering for a salad, and although there wasn’t one on the menu, the chef knocked one up from the contents of his greenhouse. For mains, Bronwyn had another of those stunning Icelandic lamb dishes; the lamb here is to die for. I went for an almond-encrusted fillet of arctic char. All wonderful. We left fat and happy. The eponymous water spout at Geysir no longer performs on a day to day basis, it is only active during earthquakes. Fortunately the nearby Strokkur still runs every eight minutes or so. We watched quite a few cycles, varying from quick bursts to big jets, or even double jets. The thing that surprised me was the short duration of each blow, only a second or so. We entertained ourselves watching other tourists trying to catch the eruptions on film. The final waterfall on the Golden Circle tour is Gullfoss, the largest waterfall in Europe. It was by now close to sunset, and the wind chill was seriously bitter, so we scuttled around the falls mummified in layers of fleece and feathers. Gullfoss itself is pretty impressive, with a wide upper fall followed by a second at ninety degrees down into a transverse gorge, all hung about with snow and ice. There is a path down to the waterside, but it was encased in ice and closed for the winter season, so we peered down at the falls from above. Shivering but content, we hit the road and headed for Reykjavik, where we needed to drop the car off at the rental office. As I pulled out onto the highway, I felt a moment of melancholy that our road trip was nearly over. Then the setting sun peeked out from the clouds and illuminated the snow-covered slopes beside us, and the sadness was lost in a gorgeous pink haze of beauty. This entry was posted in Europe, Iceland, Travel on 2014/02/11 by Reinhard.